I know I use a lot of flours in gluten free recipes compared to some of the popular cookbooks, but I do find I get the best results this way. My goal is not only the taste, but also to make the flour mixes as nutritional as possible. I avoid the use of rice flour as it is not only nutritionally inferior, but in my opinions creates dry and tasteless baked goods. 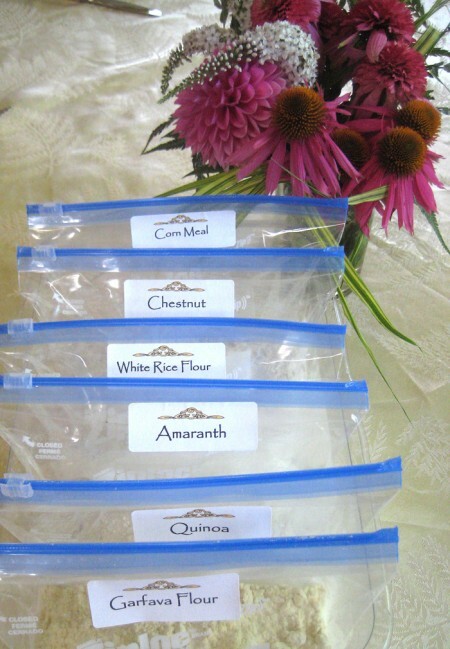 Anyway, after trying all sorts of organizations, I have come up with this method using zipper bags, and it not only keeps the flours organized, it is really easy to scoop out amounts and just leave them in their organized row. I just pack this all up in its box and keep the flours in the freezer until the next time I bake. I use almost all flours I grind myself in a nutrimill, and freezing them is not necessary but does keep the flavour top notch. I caved in to the use of spray grease several years ago when I found out that even my mother, a wonderful baker, was using it. It is so easy to use, and I have always hated greasing pans. However, I have really been trying to be more environmentally friendly, and the spray grease is not only expensive, it leaves a lot of waste cans polluting the environment. So, I did remember using a lecithin mix many years ago when I baked copius loaves of bread. The problem with my previous use of lecithin was that you had to use a brush, which inevitably got very grimy and difficult to clean and store. On a recent trip to the local bulk store I was thrilled to find a silicone brush that has the little holes that retain liquid better than the plain ones, and a jar of lecithin for only 5.99. After researching several methods on the internet, I ended up making my own version, and it works perfectly. The mix is 2 tsp lecithin, dissolved in 1/4 cup of vodka. 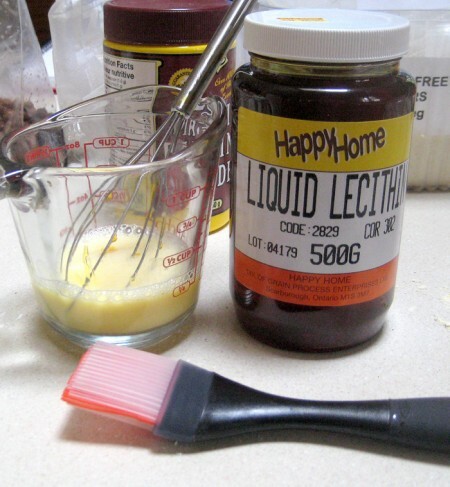 Lecithin is an emulsifier, so this mix stays together. Grease the pans with the silicone brush before baking. I found the mix recipes had less lecithin, and the first batch with one teaspoon worked, but not as well as spray grease. The additional teaspoon solved this. The other method is to use oil instead of vodka. Oil is cheaper, so maybe I will try that when I run out of this. I remember the oil mixture I had used in the past was pretty gooey, so I wanted to try the vodka. Works like a charm, and no spray grease cans to worry about. Here is a close up of the middle of the brush. This one was the good grips brand. These are easy to wash, you can even put them in the dishwasher. This entry was posted on Thursday, August 5th, 2010 at 2:33 pm	and is filed under baking, gluten-free. You can follow any responses to this entry through the RSS 2.0 feed. Both comments and pings are currently closed.